It’s the end of the 1st Quarter, and I am SO GLAD I decided to keep track of our books like this! I know that it has helped us in loads of ways, and has changed some of my thinking as well. Secondly, I’d have to say that our excitement with #classroombookaday has changed my intention, purpose and selection of read alouds in our class. Read aloud has also been a big deal in my classroom, and I completely believe that it is a crucial piece of the puzzle to creating strong readers and writers–and thinkers! In the past, however, my read alouds have been primarily chapter books. Even in 1st grade, my book choices were longer texts (often series or other stories) that I know and love that I want to expose my kiddos to so they can love them, too! First grade read alouds last time included graphic novel series like Lunch Lady and Babymouse, which most kiddos hadn’t yet heard of. We also enjoyed many authors that wrote a variety of different kinds of books, like Kate DiCamillo. We have read the Mercy Watson series, the Leroy Ninker series, as well as The Miraculous Journey of Edward Tulane. While I do believe I will eventually get around to reading longer texts and starting our Read Aloud Timeline (another core part of my literacy instruction), I think this will probably not happen now until after the new year. Because of my focus on the #classroombookaday challenge, I’ve become more interested and aware of great picture books and picture book authors that I didn’t really know before (it’s weird I know, I am a first grade teacher and I didn’t really read picture books). This has lead to some new friends and new favorite books and new people to connection with on Twitter with my class. This whole process has also increased the amount of books that kiddos bring me from home or from the library that we “HAVE TO READ.” I love that they are being more discriminate about what their friends might like or what a “good” book sounds like. Win/win for everyone, wouldn’t you say? Ok, so here’s our new door picture, up to date from last Friday. We’re up to 152 now–which blows my mind! And we still stop to look at the beautiful book covers (as does almost everyone else who walks by!) every time we’re in the hall. Check it out! This week we read many less books than previous weeks. I’d say it was probably because it was the last week of the quarter and so worked much more on finished up assessments and such instead of gathering together on the rug for a lesson (which is when most of our read alouds happen). We have 3 kid-written books on our door this week, as well as a Curious George book, a wordless book by Tomie dePaola (which is a new author to us), another Ashlyn Anstee book that also has an Emily Arrow songEmily Arrow song, a Pigeon book we hadn’t read, a Pete the Cat math book and the second book from the Global Read Aloud schedule. Whew! Even with less titles, we were busy and engrossed in REALLY GOOD BOOKS! Mara, Kaiden and Aadish are three kiddos that have been most interested in writing their own texts for our class to read. This week we had one from each of them, but I’m sorry to say I only have a picture of Kaiden’s book–not of him actually reading it. Sorry buddy! We added 3 Piggie and Elephant titles to our door, which we LOVE!! We read another Peter Brown book ( well, 2 of them actually), and we’re becoming fans of another great author. We loved My Teacher is a Monster and noticed lots of great things happening in the illustrations. Then we shared The Curious Garden and LOVED it! And we found The Curious Garden because we’d seen the amazingly beautiful song by Emily Arrow on her YouTube channel. What a great partnership between music and literature! And speaking of The Curious Garden, we had great conversations about grit and growth mindset from that little city garden and the boy who helped it grow! We added some Olivier Dunrea titles to our list, too, which we found after we first read Ollie the Stomper for shared reading early in the year. Since the first one, we’ve met Gideon, his octopus buddy Otto and a perfect pair of friends named Jasper and Joop. This coming week there’s more on the list to explore! Another Ame Dyckman title was enjoyed this week– Wolfie the Bunny! We read our first title for the Global Read Aloud this week and interacted with Nana in the City by Lauren Castillo. We drew and wrote about how we could be brave in our capes. We’re excited for next week’s book–The Troublemaker! Lastly, we had a really special mystery reader come to our class and share a funny book with us called Naked by Michael Ian Black–Allison Bearden! Do you recognize that name? It’s my cutie-pie kindergarten daughter! She had been reading and rereading Naked, practicing sounding like a storyteller, and I asked her if she wanted to read it to my first graders. She was excited about that idea, and when she showed up, my kiddos were, too! They were great listeners, Allie was a great reader and Rm. 202 kids were impressed that she could read the words in that book! The next request was that Riley Bearden come down from 4th grade and share a book with them. He’s ready to take on that challenge, so maybe he’ll be here next week on the 20somethingkids blog! Another great week of reading, inspiring, thinking and book-loving in Rm. 202! Thanks for reading! Do you have a suggestion of a book we could read? We LOVE recommendations from other readers! I’ve shared a couple of versions of the Recipe for a Good Book lesson I’ve taught in the past. As far as I can remember, I hadn’t yet taught this whole deal with first graders. I’m thinking it’s because the focus for so long has been on the definition of “just-right” books being focused on the level of the book (and less on the reader, I’d say). I do agree that being in a book that you can read is important, but I would propose that being in a book at all–and a book that you LOVE–sets the stage as importantly as kiddos start their reading journey. So this year, I’ve decided that the first lesson I taught would NOT be on “just-right” books in terms of knowing the words and understanding the story (but again, don’t hear me saying those things aren’t important, just not first), but would instead be on understanding and identifying what we like as readers. And since we’re 105 books into #classroombookaday and have shared so many great texts together, I thought it would be a great place to start to zoom in on authors. Then I asked a question: Why is it important to know an author’s name? They had some great ideas and already came with a lot of knowledge of writers from kindergarten. They were able to name some great ones (from this year’s books, from books previous teachers had read, and also some from their at-home reading) like Jeff Kinney, Dav Pilkey, our favorite right now Mo Willems, and Ame Dyckman (another new favorite!). I added in another important reason, too, related to just respecting the writer for the hard work it is to write a book! After our initial talk, I got kids thinking about the kinds of books they like to read and told them an unbelievable story about someone I know who went to the library and didn’t have any idea what they were looking for, and about someone else who didn’t know the author’s name and asked the library for “a green book with a dog on the front that’s about this big.” Crazy, right? Well, yes, of course, some first graders (and much older students, too!) book shop like that, and I think it my duty to help change that (both for their “now” reading lives and their future selves). Next step was to create a visual that they could use to remind themselves once they were in a shopping situation (in our classroom library, our school library, and heck, even Barnes and Noble!) of what they were looking for, rather than just roam around aimlessly or worse yet, get themselves into trouble because they didn’t know what to do. I used the format of the Recipe for a Good Book as I had with previous classes, but instead of making it into a bookmark (which works best for kiddos that are primarily shopping for and reading chapter books), we made ours with pictures and words on full sheets of paper. Kiddos could write or draw anything they knew they liked about books, including authors, titles, genres (if they knew this info) and even topics. And since we had already read over 100 great titles together, kiddos were able to use our display to help them with their visuals. I’m amazed every day about what a great idea that door display of our reading continues to be. We keep finding different ways to use it! As I mentioned in my original post, I was trying not to be a groupie, but was forward enough to ask her to help with us with our WRAD plans. Surprisingly, she said yes, and so I began thinking about what we could do together. I knew my friends were dying to ask her many more things about her writing life, and specifically to see more of what her writing studio looked like. And because it was read aloud day, we hoped she would read to us, too! When she was here, she had told us all about the process of writing The Gingerbread Girl. She also told us about how she got the idea for the sequel to it: The Gingerbread Girl Goes Animal Crackers. As I remembered this detail, I knew that was the book I wanted her to read! So we settled in for our Skype call with her, and has 40 or so kindergarteners join us for the experience! I invited my son, Riley’s, class to come up and hear the story (partly because I knew they’d love the book, but selfishly because I knew HE would love it–we are always talking about books and authors at home!). Then Ms. Weidinger shared it with Ms. Heifner and they came along, too! WOW–what a great bunch of kiddos gathered to share such a great day! Look at all those kiddos! It’s really cool that little kids and big kids alike can share an experience like this one! Man, it must be crazy cool (and a little bit weird) to be able to read a REAL book that YOU wrote to other people. I’m a little jealous. After we enjoyed her sharing her story with us (which is a MUST READ in our opinion! ), our little friends left and we settled in to chat with our new best author friend! We had some great questions left over from our time with her last week: Will you ever write an autobiography? Do you like writing fiction or nonfiction better? Can we see more of your office? What an amazing visit with an amazing lady! I, for one, was inspired to get myself published, and I know my students were inspired as well! What a treat! THANK YOU LISA! How did you celebrate World Read Aloud Day? Who is your favorite author? 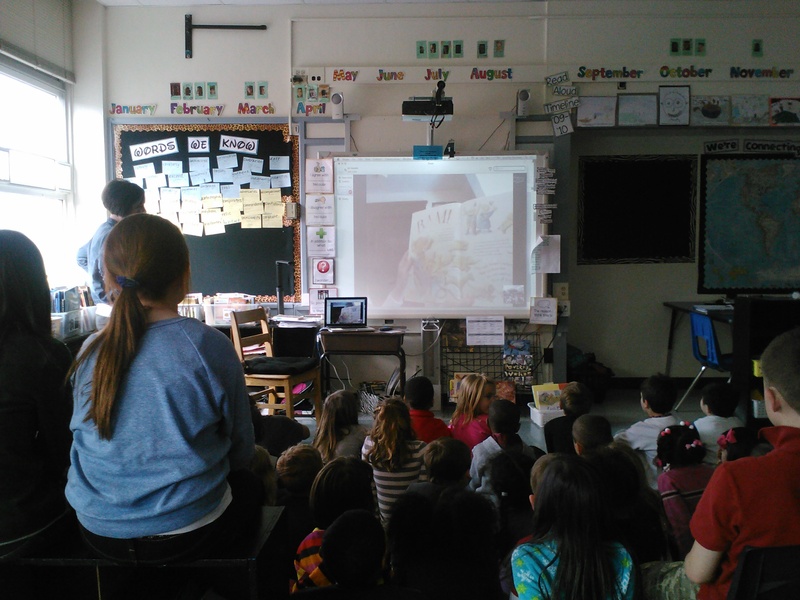 Have you every Skyped with an author? If so, who? Tell us about it!